Cubic zirconia (or CZ) is the cubic crystalline form of zirconium dioxide (ZrO2). The synthesized material is hard, optically flawless, and usually colorless, but it can be produced in a variety of different colors. It should not be confused with zircon, which is zirconium silicate (ZrSiO4). Given its low cost, durability, and close visual likeness to diamond, synthetic cubic zirconia has remained the most gemologically and economically important competitor for diamonds since 1976. It is marketed as a "diamond simulant." Its main competition as a synthetic gemstone is the more recently cultivated material, synthetic moissanite. Discovered in 1892, the yellowish monoclinic mineral baddeleyite is a natural form of zirconium oxide. This form, however, is rare and has little economic importance. The extremely high melting point of zirconia (2750°C) posed a hurdle to controlled single-crystal growth, as no existing crucible could hold it in its molten state. However, stabilization of zirconium oxide had been realized early on, with the synthetic product stabilized zirconia introduced in 1930. Although cubic, it was in the form of a polycrystalline ceramic. It was used as a refractory material, highly resistant to chemical attack and capable of withstanding temperatures of up to 2540°C. Seven years later, German mineralogists M. V. Stackelberg and K. Chudoba discovered naturally occurring cubic zirconia in the form of microscopic grains included in metamict zircon. Thought to be a byproduct of the metamictization process, the two scientists did not think the mineral important enough to give it a formal name. The discovery was confirmed through X-ray diffraction, proving the existence of a natural counterpart to the synthetic product. As with the majority of grown diamond look-alikes, the conceptual birth of single-crystal cubic zirconia began in the minds of scientists seeking a new and versatile material for use in lasers and other optical applications. Its evolution would eclipse earlier synthetics, such as synthetic strontium titanate, synthetic rutile, yttrium aluminum garnet (YAG), and gadolinium gallium garnet (GGG). Some of the earliest research into controlled single-crystal growth of cubic zirconia was performed in the 1960s in France. Much of that work was done by Y. Roulin and R. Collongues. This technique involved molten zirconia being contained within a thin shell of still-solid zirconia, with crystal growth from the melt. The process was named cold crucible, an allusion to the system of water cooling used. Though promising, these pursuits yielded only small crystals. Later, Soviet scientists under V. V. Osiko at the Lebedev Physical Institute in Moscow perfected the technique, which was then named skull crucible (an allusion either to the shape of the water-cooled container or to the occasional form of crystals grown). They named the jewel Fianit, but the name was not used outside of the USSR. Their breakthrough was published in 1973, and commercial production began in 1976. By 1980, annual global production had reached 50 million carats (10,000 kg). As its name would imply, cubic zirconia is crystallographically isometric. Given that diamond is also isometric, this is an important attribute for a diamond simulant. Synthesized material contains a certain percentage (7-20 molar percentage) of metal oxide stabilizer. In the absence of the stabilizer, synthesis of zirconium oxide would produce monoclinic crystals, which are the stable form under normal atmospheric conditions. The stabilizer is required for cubic crystal formation. It is typically either yttrium or calcium oxide, the amount and stabilizer used depending on the many recipes of individual manufacturers. Therefore, the physical and optical properties of synthesized CZ vary, all values being ranges. Cubic zirconia is a dense substance, with a specific gravity between 5.6–6.0. It is relatively hard, at about 8.5 on the Mohs scale—much harder than most natural gems. Its refractive index is high at 2.15–2.18 (B-G interval) and its luster is subadamantine. Its dispersion is very high at 0.058–0.066, exceeding that of diamond (0.044). Cubic zirconia has no cleavage and exhibits a conchoidal fracture. It is considered brittle. It is considered brittle because although it has a hardness of 8.5 it can still easily be fractured because the hardness of a mineral refers to its tendency of being scratched. Under shortwave UV cubic zirconia typically luminesces a yellow, greenish yellow or "beige." Under longwave UV the effect is greatly diminished, with a whitish glow sometimes being seen. Colored stones may show a strong, complex rare earth absorption spectrum. Worker monitoring melting zirconium oxide and yttrium oxide in an induction heated "cold crucible" to create cubic zirconia. The Soviet-perfected skull crucible is still used today, with little variation. Water-filled copper pipes provide a cup-shaped scaffold in which the zirconia feed powder is packed, the whole contraption being wrapped with radio frequency induction coils running perpendicular to the copper pipes. A stabilizer is mixed with the feed powder, being typically either yttria or calcium oxide. The RF induction coils function in a manner similar to the primary winding in a transformer. The zirconia acts as the "secondary winding" of a transformer which in effect is "shorted" out and thus gets hot. This heating method requires the introduction of small pieces of zirconium metal. The metal is placed near the outside of the charge and is melted by the RF coils and heats the surrounding zirconia powder from the outside inwards. The cooling water-filled pipes embracing the outer surface maintain a thin "skin" (1-2 mm) of unmelted feed, creating a self-contained apparatus. After several hours the heat is reduced in a controlled and gradual manner, resulting in the formation of flawless columnar crystals. Prolonged annealing at 1400°C is then carried out to remove any strain. The annealed crystals, which are typically 5 cm long by 2.5 cm wide (although they may be grown much larger), are then cut into gemstones. In recent years, manufacturers have sought ways of distinguishing their product by supposedly "improving" cubic zirconia. Coating finished CZs in a film of diamond-like carbon (DLC) or Amorphous Diamond is one such innovation—a process using chemical vapor deposition. The resultant material is purportedly harder, more lustrous and more like diamond overall. The coating is thought to quench the excess fire of CZ, while improving its refractive index, thus bringing it more in line with diamond. Additionally, because of the high percentage of diamond bonds in the amorphous diamond coating, the finished simulant will show a positive diamond signature under Raman spectroscopy. Another technique first applied to quartz and topaz has also been adapted to cubic zirconia: Vacuum-sputtering an extremely thin layer of metal oxide (typically gold) onto the finished stones creates an iridescent effect. This material is marketed as "mystic" by many dealers. Unlike DLC, the surreal effect is not permanent, as abrasion easily removes the oxide layer. A few key features of cubic zirconia distinguish it from diamond. Some of these are observable only under a microscope or loupe. Examples are noted below. 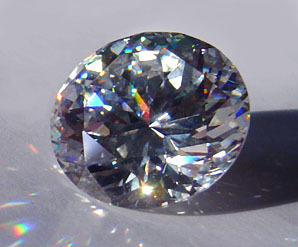 Dispersion: With a dispersive power greater than diamond (0.060 vs. 0.044), the more prismatic fire of cubic zirconia can be recognized even by an untrained eye. Hardness: As noted above, cubic zirconia has a hardness of 8.5 to nearly 9.0 on the Mohs hardness scale, whereas the rating for diamonds is 10. Specific gravity: Cubic zirconia crystals are heavyweights compared to diamonds. A cubic zirconia crystal will weigh about 1.7 times more than a diamond of equivalent size. Flaws: Contemporary methods allow the production of virtually flawless crystals of cubic zirconia. By contrast, most diamonds have some sort of defect, be it a feather, included crystal, or perhaps a remnant of an original crystal face (for example, trigons). Refractive index: Cubic zirconia has a refractive index of 2.176, compared to a diamond's 2.417. Cut: Under close inspection with a loupe, the facet shapes of some cubic zirconias appear different from diamonds. Color (or more precisely, the lack thereof): Only the rarest of diamonds are truly colorless, most having a tinge of yellow or brown to some extent. By comparison, cubic zirconia can be made in most cases entirely colorless: equivalent to a perfect "D" on diamond's color grading scale. Thermal conductivity: Cubic zirconias are thermal insulators while diamonds are among the most efficient thermal conductors, exceeding copper. This makes telling the difference between diamond and cubic zirconia quite easy for those with the right instruments. Kuz'minov, Yu. S., E. E. Lomonova, and V. V. Osiko. 2003. Cubic Zirconia and Skull Melting. Cambridge: Cambridge International Science Pub. ISBN 978-1904602019. Nassau, Kurt. 1980. Gems Made by Man. Radnor, PA: Chilton Book Co. ISBN 0801967732. Sliwa, Cynthia A., and Caroline Stanley. 2007. Jewelry Savvy: What Every Jewelry Wearer Should Know. Redondo Beach, CA: Jewels on Jewels. ISBN 978-0970340757. What is Cubic Zirconia? wiseGEEK. This page was last modified on 24 November 2017, at 20:39.